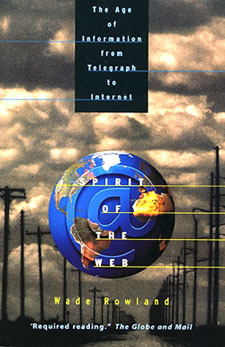 Now in its third edition, Spirit of the Web has become required reading in business and education, a fixture in every wired household. From the publisher’s catalogue: “The urge to communicate over distance and time is one of the most basic of human impulses. It has led us from the megaphone to the drum, to smoke signals, to the telegraph and penny post, to telephony, radio and television and finally to today’s digital multimedia. “This popular history of evolution of the ways we communication gives us fascinating and important perspective in understanding the roots of the modern electronic revolution. It shows how the wiring of our planet for the last one hundred and fifty years has led to the Global Village we now inhabit. “This is a vast and absorbing story about the human imagination and its resourcefulness. It is a dramatic story that includes personalities and inventions; the social, economic and political consequences of those technologies, as well as a philosophical subtext about communications theory and how it has changed our world.